Recently one of the publicists at Tilbury House sent me two non fiction titles about a lady who raised a baby elephant, and who subsequently went on to found a sanctuary for captive elephants. Both books, Travels with Tarra and Just for elephants, greatly moved me because of my background. Some years ago I wrote my thesis about captive elephants in India, and I also did a personal study on elephants in various zoos. It always distressed me greatly when I saw elephants having to endure squalid conditions, loneliness, and boredom. years she traveled the U.S., Canada, and abroad performing in a number of circuses with Tarra. 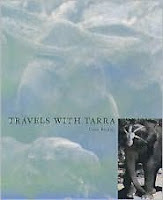 Their story is told in her award-winning first book, Travels With Tarra. In 1995, with Scott Blais, Carol founded the nation's first natural-habitat refuge for sick, old, and needy elephants, the Elephant Sanctuary. As executive director, she helps care for the elephants, arranges for needy elephants to be moved to the Sanctuary, and develops and implements educational programs, both for the public and for school children, to benefit the elephants wherever they might be. Marya: In Travels with Tarra, you describe how you and Tarra used to travel around the country performing in shows of various kinds. What made you decide to change this way of life? Marya: Tarra mostly grew up around humans, and she had a hard time getting used to being around other elephants. How did you help her feel comfortable with creatures of her own kind? Marya: Why did you decide to set up an elephant sanctuary in Tennessee? Carol: I wanted Tarra to live in a healthy environment. My experiences with the zoo and circus industries clearly demonstrated a lack of appropriate space, herd dynamics and progressive management philosophy. I did not want Tarra to spend her life in a deprived environment and I was determined to create a healthy place for her to live. Carol: There are less than 600 elephants living in zoos and circuses. We know about their lives and their treatment. It is difficult but we have to wait until the owner is ready to send the elephant to us or the federal government is wiling to step in and confiscate to end the elephant's suffering. Marya: And how do you raise the funds to care for them? sanctuary resident, Shirley. Jenny has since died. How did Shirley react to losing Jenny, who was like a mother to her? Carol: Shirley was devastated when Jenny died just as any mother might be. Shirley mourned the loss of her dear friend and for weeks. She lost her appetite and was not responsive to her caregivers for days. Fortunately one of the other elephants, Bunny who was close with Shirley and Jenny, comforted Shirley in her time of need and their bond grew deeper. Bunny's love and compassion helped Shirley recover from her loss. Marya: Most of the elephants at the sanctuary are Asian elephants, but you also have a few African elephants. How do the two species get along? Carol: Our African and Asian elephants are provided separate habitats so that they are not required to get along. They are two separate species with different language and behavior, providing the most natural setting possible means these two species are not mixed. Marya: Why did you decide to write about Tarra and the sanctuary? Marya: Do you think the books have helped to raise awareness of the plight of elephants in captivity? Marya: Many of the elephants who come to the sanctuary have had a hard life. Shirley is one of these. Have their experiences made any of these elephants permanently angry, or are they able to move on, to forgive, and to be happy? Carol: Elephants appear to me to be the most forgiving and compassionate of any species on our planet maybe equal with Gorilla, whales, and dolphins, and perhaps other species that we have yet to acknowledge. But elephants are superior in their ability to not hold a grudge, not seek revenge, to love those who mistreat them and to show compassion even when their lives are so deprived. It is not surprising to me that in ancient Asian cultures the elephants is viewed as a god, a reincarnate of Buddha himself. Marya: One of the wonderful things about your sanctuary is that the elephants can live in herd, which is what they would do in the wild. Has one of them taken on the role of the matriarch – which is what happens in wild herds? Carol: In the wild elephants are born into a herd and the elder is the matriarch. At the Sanctuary Shirley as served as that wise and compassionate individual since her arrival, yes she is the oldest as well. In the separate habitat occupied by the divas Lottie serves in the capacity, her calm, sure and wise ways make her a perfect leader. Carol: We have 24 full time staff members and 12 of them are elephants caregivers. Marya: How can we elephant fans help you in your work? 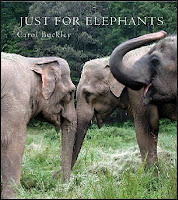 Carol: Our goal is to raise awareness about elephants and the lives they are forced to live in captive situations. Even the best of zoos deprive elephants from their most basic needs of room to roam, compatible others, and access to year round live vegetation. The best way anyone can help is to educate themselves regarding true elephant needs and then starting in their own community to make sure any elephant that lives in their community is provided for adequately. You can also support Carol's captive elephants by 'adopting' one of her girls or by giving the sanctuary a donation. Please visit the Elephant Sanctuary website for more information. From now through Sept. 9, anyone who tweets about the tour using the hashtag #trunktour will be entered to win a copy of Travels With Tarra or Just for Elephants. US/Canada only, two winners will be announced on Sept. 10th. You did a marvelous job on your interview for the virtual book tour! Nice to meet a fellow elephant-lover, too, Marya. Thanks so much for your wonderful interview! We're so happy to have you as part of the tour. A review of Dreaming Anastasia by Joy Preble.